The Worklio App enables you to access the company-wide Worklio administration platform from anywhere. Worklio is a cloud-based, administration platform designed for small and mid-sized businesses to eliminate the inefficiencies of manual processes, deliver better service to employees, and save time for Human Resources administrators. The Worklio App provides access from anywhere there is a mobile signal. 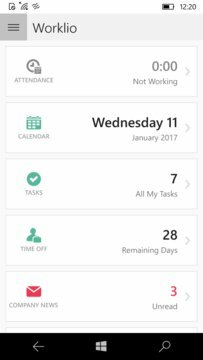 Track your time and attendance with the Worklio App. Are you in an elevator on the way home and you just realized that you forgot to log out from Worklio? Don't worry, change your working status with the Worklio App anytime, anywhere. Find all your colleagues' contact information with the Worklio App. Do you need to know if your co-worker is at her desk or enjoying her break? Look at her contact detail. Task Management organizes everything a company does according to projects and assigned tasks. All task-related communication and documentation stays in one place for easy access. With the Worklio App you do not need a desktop computer to request a vacation. Send the time off request to your supervisor on the go. It is as easy as asking for it face to face. The Worklio App also features eSignature capability for an easy and secure way to approve documents. Simply take a picture of a document’s QR code to capture it. Send it. Then recipients can add their signature by tracing their finger in the signature box. 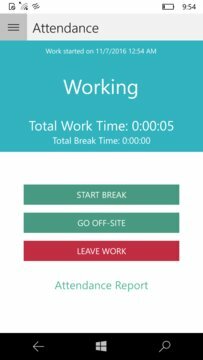 The Worklio App download is free.